Many patients with MS, Multiple Sclerosis, are surprised to find that they have significant pains with their MS. Traditionally, pain is not a large component of the MS symptoms. However, soft tissue and musculoskeletal pains may be quite common. The pains associated with MS can be very successfully treated with high-dose laser therapy. However, this is purely treating the symptom, rather than the cause, of MS. There is also theoretical potential for treating the root cause of Multiple Sclerosis with TLT. There is a remote, theoretical, untested possibility that laser TLT may be able to halt or even reverse the progression of MS within the brain and spinal cord. TLT, transcranial laser therapy, has been shown in a small series of patients to have potentially breakthrough results on PTSD and TBI symptoms including depression, sleeplessness, suicidal thoughts, and employment. TLT is being investigated for use in multiple brain disorders including PTSD, TBI Traumatic Brain Injury, Depression, and Alzheimers. TLT is thought to work by accelerating the mitochondrial production of ATP, improving cell metabolism. Additionally, there is evidence that laser stimulation increases secretion of NGF, nerve growth factor. In MS, there is some indication that ATP production is damaged, and that cell metabolism lags the auto-immune destruction of myelin. In MS, there is some indication in *mouse* models that laser therapy may be helpful in halting the progression of MS. The clinical human studies are scant and underwhelming. See selected references below. Here are results of TLT in a PTSD patient. 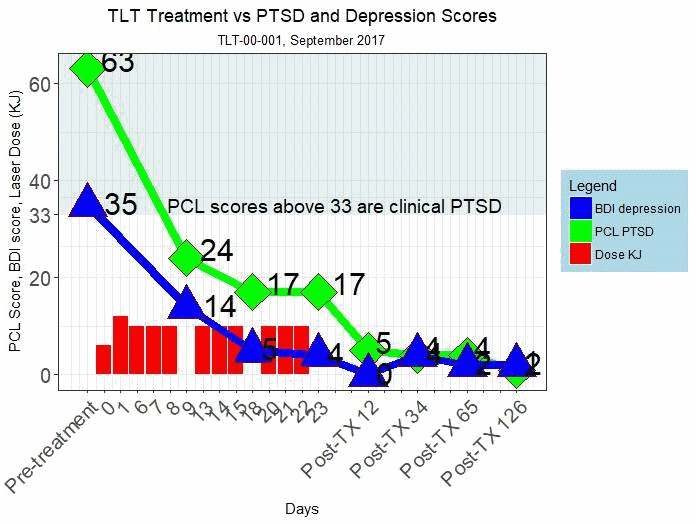 Note the 90-95% reduction in PTSD and Depression scores over 3 weeks, and persisting after TLT therapy stopped. TLT is unproven in MS. No reports of high-dose laser or TLT in humans. Very selective criteria for receiving TLT. Must be coordinated with your neurologist. TLT is an off-label use of an FDA-cleared Class 4 medical laser. Only available at the Santa Monica / St. John’s area location. You must be able to come to the Santa Monica location 2-4 times per week for 4-8 weeks. Information about TLT results to date, and a video explaining how TLT works. Background The approved immunomodulatory agents for the treatment of multiple sclerosis (MS) are only partially effective. It is thought that the combination of immunomodulatory and neuroprotective strategies is necessary to prevent or reverse disease progression. Irradiation with far red/near infrared light, termed photobiomodulation, is a therapeutic approach for inflammatory and neurodegenerative diseases. Data suggests that near-infrared light functions through neuroprotective and anti-inflammatory mechanisms. We sought to investigate the clinical effect of photobiomodulation in the Experimental Autoimmune Encephalomyelitis (EAE) model of multiple sclerosis. Methodology/Principal Findings The clinical effect of photobiomodulation induced by 670 nm light was investigated in the C57BL/6 mouse model of EAE. Disease was induced with myelin oligodendrocyte glycoprotein (MOG) according to standard laboratory protocol. Mice received 670 nm light or no light treatment (sham) administered as suppression and treatment protocols. 670 nm light reduced disease severity with both protocols compared to sham treated mice. Disease amelioration was associated with down-regulation of proinflammatory cytokines (interferon-γ, tumor necrosis factor-α) and up-regulation of anti-inflammatory cytokines (IL-4, IL-10) in vitro and in vivo. Conclusion/Significance These studies document the therapeutic potential of photobiomodulation with 670 nm light in the EAE model, in part through modulation of the immune response. Multiple sclerosis is a chronic disease of the nervous system, which main manifestations are disseminated demyelinated the changes in the central nervous system. The pathogenesis of this disease is still not known, the curative treatment is not possible. In connection with the alleged autoimmune genesis of MS patients are administered immunomodulatory drugs. Patients with multiple sclerosis suffer from a number of symptoms associated with this disease. The aim of this article is to present the main clinical symptoms characteristic of MS and to present biological effects of low-energy lasers used in the treatment of multiple sclerosis. Multiple sclerosis (MS) is an autoimmune demyelinating inflammatory disease characterized by recurrent episodes of T cell-mediated immune attack on central nervous system (CNS) myelin, leading to axon damage and progressive disability. The existing therapies for MS are only partially effective and are associated with undesirable side effects. Low-level laser therapy (LLLT) has been clinically used to treat inflammation, and to induce tissue healing and repair processes. However, there are no reports about the effects and mechanisms of LLLT in experimental autoimmune encephalomyelitis (EAE), an established model of MS. Here, we report the effects and underlying mechanisms of action of LLLT (AlGaInP, 660 nm and GaAs, 904 nm) irradiated on the spinal cord during EAE development. EAE was induced in female C57BL/6 mice by immunization with MOG35–55 peptide emulsified in complete Freund’s adjuvant. Our results showed that LLLT consistently reduced the clinical score of EAE and delayed the disease onset, and also prevented weight loss induced by immunization. Furthermore, these beneficial effects of LLLT seem to be associated with the down-regulation of NO levels in the CNS, although the treatment with LLLT failed to inhibit lipid peroxidation and restore antioxidant defense during EAE. Finally, histological analysis showed that LLLT blocked neuroinflammation through a reduction of inflammatory cells in the CNS, especially lymphocytes, as well as preventing demyelination in the spinal cord after EAE induction. Together, our results suggest the use of LLLT as a therapeutic application during autoimmune neuroinflammatory responses, such as MS. Experimental autoimmune encephalomyelitis (EAE) is the most commonly studied animal model of multiple sclerosis (MS), a chronic autoimmune demyelinating disorder of the central nervous system. Immunomodulatory and immunosuppressive therapies currently approved for the treatment of MS slow disease progression, but do not prevent it. A growing body of evidence suggests additional mechanisms contribute to disease progression. We previously demonstrated the amelioration of myelin oligodendrocyte glycoprotein (MOG)-induced EAE in C57BL/6 mice by 670 nm light-induced photobiomodulation, mediated in part by immune modulation. Numerous other studies demonstrate that near-infrared/far red light is therapeutically active through modulation of nitrosoxidative stress. As nitric oxide has been reported to play diverse roles in EAE/MS, and recent studies suggest that axonal loss and progression of disability in MS is mediated by nitrosoxidative stress, we investigated the effect of 670 nm light treatment on nitrosative stress in MOG-induced EAE. These data indicate that 670 nm light therapy protects against nitrosative stress and apoptosis within the central nervous system, contributing to the clinical effect of 670 nm light therapy previously noted in the EAE model. Irradiation by light in the far-red to near-infrared (NIR) region of the spectrum (photobiomodulation, PBM) has been demonstrated to attenuate the severity of neurodegenerative disease in experimental and clinical studies. The purpose of this study was to test the hypothesis that 670 nm PBM would protect against the loss of retinal function and improve photoreceptor survival in a rodent model of retinitis pigmentosa, the P23H transgenic rat. P23H rat pups were treated once per day with a 670 nm LED array (180 sec treatments at 50 mW/cm2; fluence 9 joules/cm2) (Quantum Devices Inc., Barneveld WI) from postnatal day (p) 16-20 or from p10-20. Sham-treated rats were restrained, but not exposed to NIR light. The status of the retina was determined at p22 by assessment of mitochondrial function, oxidative stress and cell death. In a second series of studies, retinal status was assessed at p30 by measuring photoreceptor function by ERG and retinal morphology by Spectral Domain Optical Coherence Tomography (SD-OCT). 670 nm PBM increased retinal mitochondrial cytochrome oxidase activity and upregulated the retina’s production of the key mitochondrial antioxidant enzyme, MnSOD. PBM also attenuated photoreceptor cell loss and improved photoreceptor function. PBM protects photoreceptors in the developing P23H retina, by augmenting mitochondrial function and stimulating antioxidant protective pathways. Photobiomodulation may have therapeutic potential, where mitochondrial damage is a step in the death of photoreceptors.